At the European Organization for Nuclear Research CERN near Geneva, the Large Hadron Collider's second run of collisions and collecting data on particles and their decays has just ended. Over the next two years, the accelerator will undergo maintenance and the upgrades will come to fruition. Meanwhile, physicists intensively analyze data from the just-completed run. Their investigation focuses primarily on the search for elementary particles beyond the Standard Model, such as the electrically charged Higgs boson. The most recent analysis in this field was carried out by an international team of physicists working within the ATLAS experiment. The group consisted of researchers from the Institute of Nuclear Physics of the Polish Academy of Sciences (IFJ PAN) in Cracow and five other institutions scattered around the world. “ The Standard Model is a complex theoretical structure and describes all known elementary particles with excellent accuracy. We know, however, that it works well for experimentally accessible energies. At really high energies, the Standard Model predictions break down and hence the need for new, wider description, so-called new physics ”, says Dr. Pawel Bruckman (IFJ PAN) and recalls that classical mechanics, for example, shows similar features. When the energy of moving bodies is low, its description is exact. However, when the speed becomes comparable to the speed of light, Newtonian physics must give way to relativistic theories. “ We have been exploring a very wide range of masses. The mass of the proton, i.e. the nucleus of the hydrogen, is about one gigaelectronvolt. In turn, the mass of the quark t, the most massive of the so far discovered elementary particles, is 173 gigaelectronvolts. We were looking for traces of the existence of a charged higgs in the mass range from 90 gigaelectronvolts up to 2000 gigaelectronvolts ”, explains the PhD student Marzieh Bahmani (IFJ PAN). “ Within the current sensitivity, we can say at the 95% confidence level that in the selected range of masses we have not observed charged Higgs bosons. This is a very strong limitation on the new theories. 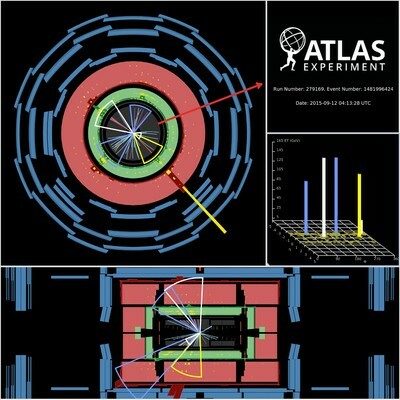 We intend to improve it even further in the next round of the analysis, by taking into account all data from the recently completed second run of the LHC accelerator. It is still possible that the charged Higgs is hidden somewhere in the mass range covered by our analysis, but we are not yet sensitive enough to see its signal ”, says Dr. Anna Kaczmarska (IFJ PAN).